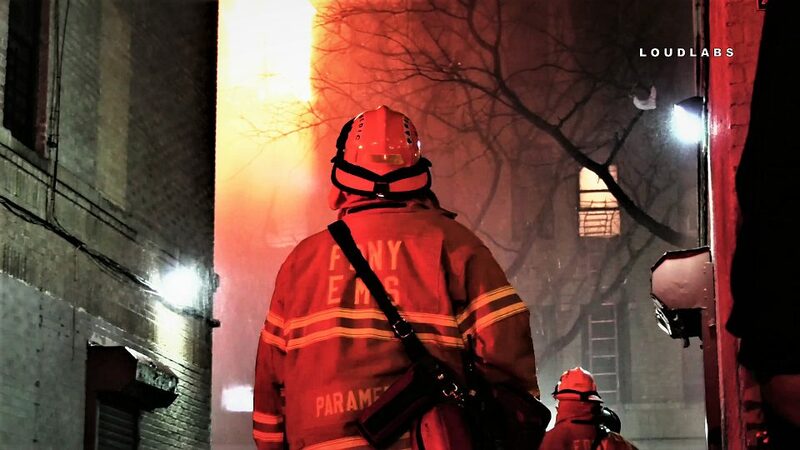 3.27.19 | by Adam Balhetchet | MORRIS HEIGHTS, Bronx (LoudlabsNYC) – A 2-alarm fire injured six people and claimed the life of a cat. It happened around 2 am Wednesday, at a NYCHA apartment complex at 1925 University Ave, within the confines of the 46th Precinct. Flames could be seen shooting out of the 2nd-floor window, which is where the fire started. As flames extended towards the 3rd and 4th floors, firefighters transmitted the second alarm for additional firefighters and trucks to fight the fire. Residents including children were evacuating the building via the fire escapes, with the assistance of police officers. Six total residents were injured. Three of them were in serious but stable condition. Another three suffered minor injuries. They were treated and transported to an area hospital. One resident’s cat died in the fire. By 3:15 am the fire was under control. Although the fire marshall will determine the definite cause of the fire, some residents believe the fire was started by space heaters being used in the building since the NYCHA building did not provide heat.